RCR International offers environmentally friendly energy-generation solutions for power-intensive industries and gas-fired combined heat and power plants. Our global expertise and involvement includes and embraces master planning, conceptual development, technical and economic feasibility evaluations, engineering, procurement, construction, project management, commissioning of installations, and operation and maintenance services. We hold a particularly strong position in delivering plants that specialize in the combustion of biofuels and wastes. We have years of experience in the recovery of energy and chemicals from waste. We can design, engineer and construct steam and power generating facilities for the petroleum, electric utility, pulp & paper, chemical, and metallurgical industries. Many of our projects utilize the output of waste-heat recovery units combined with supplemental fuel as boiler-fuel feed. Some of these power generation systems utilize a variety of fuels in different technology configurations, using feedstock that includes coal, tires, plastics and biomass to fire steam turbines. Some plants are set up with controlled extraction and condensing systems as well as combined-cycle combustion turbine systems. RCR works with a wide range of customers, including independent power producers, utilities, project developers and manufacturers. Our technical expertise resides in a number of operating centers networked by advanced global integrated engineering, procurement and project management systems. Using secure communications over the Internet, these systems connect all offices and project sites, and deliver our customers real ‘added value’ at every stage of the project lifecycle. In recent years, we have developed a strong project group which is focused on providing consultancy, engineering and turnkey project services for customers wishing to develop CHP/Cogeneration facilities, typically in the 5 – 60 MW(e) range, although we have the capability to handle larger outputs. The working knowledge of our host customers’ systems and the process interfaces eliminates complications when moving from conceptual design through to commissioning of the finished plant. RCR technologies are not only stand-alone resource recovery and recycling systems but also combined heat & power (CHP) technologies. These integrated systems produce both electricity and steam from a single fuel source at a facility that is strategically located near a consumer. These efficient systems recover heat that normally would be wasted in an electricity generator, and save the fuel that would otherwise be used to produce heat or steam in a separate unit. RCR International can integrate state-of-the-art centralized systems (a combined-cycle combustion turbine fueled from oil or syngas produced from resource recovery and recycling) resulting in maximum system fuel-efficiency for delivered power in the range of 55-60%. At this efficiency level, CHP systems will effectively double the central electric systems’ average delivered fuel-use efficiency of approximately 30%. 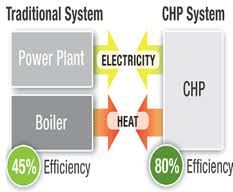 However, under common circumstances, CHP systems will achieve efficiencies exceeding 70%. 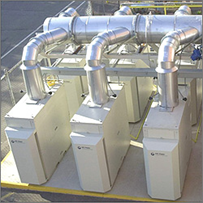 CHP systems achieving efficiencies exceeding 80% are frequent, and some systems have been shown to reach levels in excess of 90%. All of these power performance upgrades are ready for use today.